TM-Town is releasing a new feature today to help you, the freelance translator, easily track your daily productivity. 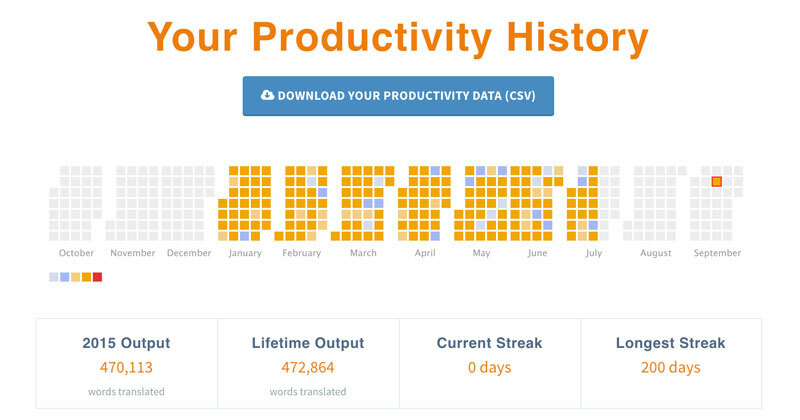 In less than 5 minutes you can record your day's work and TM-Town's tool will visualize your productivity data for you. TM-Town's tool is dead simple to use and in only a few minutes you can easily fill out your daily report. Just slide the bars and that's it. TM-Town even has a setting to set up an automatic email reminder for the next day's report. With TM-Town's tool you can view various graphs and charts and see how your data changes over time. Your data is yours and you can easily export it at any time. TM-Town may report aggregate data across all translators from time to time; however, your individual data stays private and can not be viewed by anyone but yourself. Give it a try! If you are logged in you can create a new report here. Are you a freelance translator? Sign up for a free TM-Town account today and start tracking your productivity.